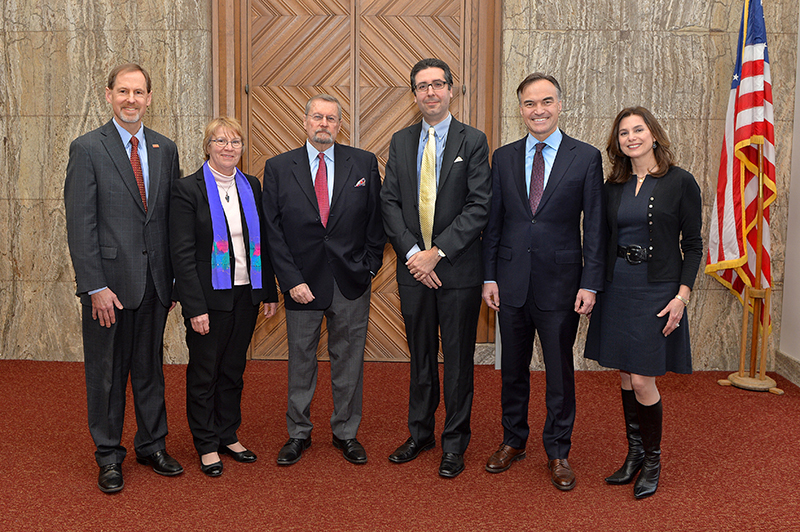 Left to right: Senior Vice President and Provost Jonathan Wickert, Dean Beate Schmittmann, Steffen Schmidt, University Professor and Lucken Professor in Political Science, Jonathan Hassid, associate professor of political science and recipient of the Lucken Faculty Fellowship, Kent Lucken, Kristen Lucken. A medallion ceremony in the College of Liberal Arts and Sciences celebrated the official installation of Steffen Schmidt as the inaugural holder of the Lucken Professorship in Political Science and Jonathan Hassid as the inaugural holder of the Lucken Faculty Fellowship. Iowa State University Senior Vice President and Provost Jonathan Wickert, and Dean of the College of Liberal Arts and Sciences Beate Schmittmann, presented the medallions on Nov. 26 in the Campanile Room of the Memorial Union. The awards were established with a gift from Kent A. Lucken, a 1986 Iowa State graduate in political science, and his wife, Kristen Lucken. Hassid and Schmidt have held the endowed faculty positions since October 2017. The Lucken Professorship in Political Science recognizes a faculty member in the department of political science who demonstrates excellence in teaching, research and service. Schmidt has researched comparative politics and women in politics with special emphasis on Latin America and developing countries. He teaches Introduction to American Government and Politics, Latin American Politics and other courses. He has served on the Iowa State University Lectures Committee since its founding, and he chairs the International Program in the College of Liberal Arts and Sciences. Schmidt has received numerous awards for his teaching and service. “The named professorship is crucial to my being able to expand my professional work as an instructor, mentor and national speaker. The professorship has also given much greater visibility to the political science department, the College of Liberal Arts and Sciences and, of course, Iowa State,” said Schmidt. The Lucken Faculty Fellowship supports a faculty member who is advancing students’ understanding and appreciation for China and its expanding role in shaping international affairs and the global economy. Hassid is a China specialist who joined Iowa State University in 2015 after graduating with a doctorate in political science from the University of California, Berkeley, and then spending four years as a doctoral fellow in the China Research Centre at the University of Technology in Sydney, where he received an Early Career Researcher Award in 2013. Kent and Kristen Lucken were also awarded a donor medallion during the ceremony in recognition of their generosity in establishing the two named positions.